smallest cpap in the world, auto ramp, bluetooth, smartstart. 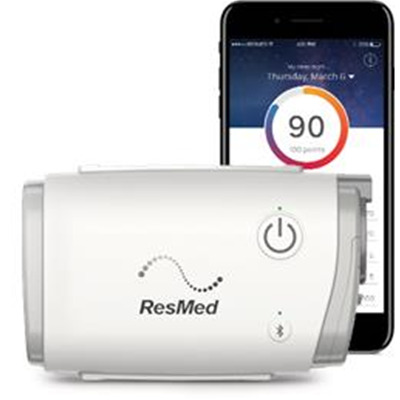 The world’s smallest CPAP Machine at just 10.6 oz and 5.4 x 3.3 x 2.0 inches, the AirMini comes with the same therapy modes as the standard AirSense 10 Auto device and offers many of the same popular features including AutoRamp, Expiratory Pressure Relief (EPR), BlueTooth connectivity and SmartStart. With the AirMini app, getting your sleep data is easy. Receive your sleep score each morning and 30-day history, so tracking progress is not interrupted by travel schedules and can be done anywhere. Compatible Mask: The AirMini will ONLY work with one of these three masks: AirFit P10 Nasal Pillow Mask, N20 Nasal Mask and the F20 Full Face Masks.